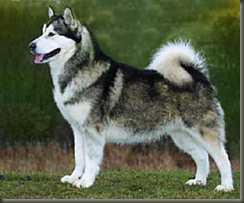 Alaskan Malamute Experiment... signed, sealed, delivered! 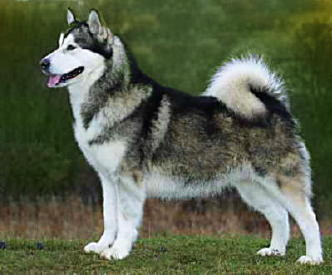 I started the fiber prep by removing as many guard hairs from the dog fur as possible. 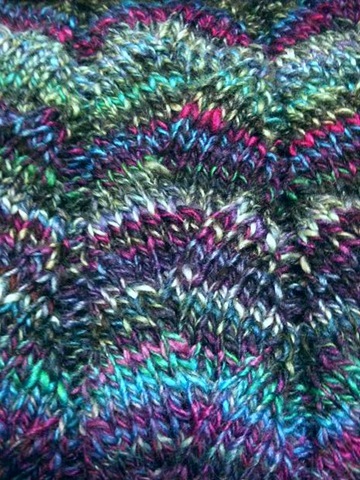 Guard hairs are bristly, and would have resulted in prickly bits in the finished yarn... and I didn't want that. 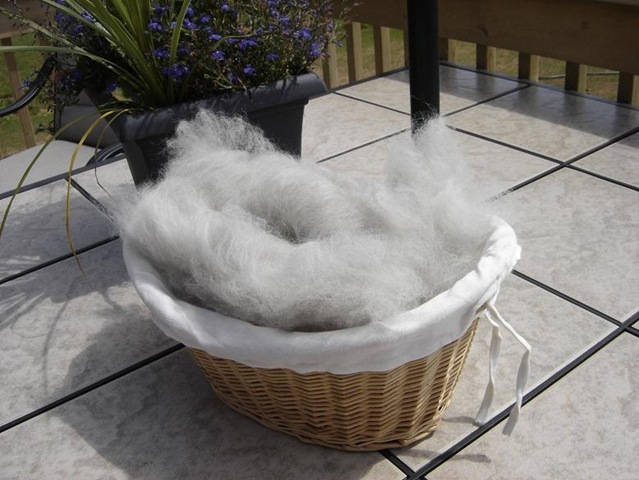 Then the fur was weighed, and blended 50-50 by weight with some nice fine Merino Sheep's wool. I carded and blended all of the fiber by hand on some regular Ashford Hand Cards... mostly because I like the process of hand blending. I weighed small amounts of fiber that were comfortable to work by hand (around 4-5 g of fiber at a time) and the resulting rolags were light and airy - perfect for some woolen style spinning. The swatching process was fun... I decided to spin up a small sample (about an ounce or so) of the wool at a sport/worsted size and knit some small swatches in different stitch patterns to show my client. In the end, because the yarn had so much halo and fuzzy feeling, a sport weight yarn really knit up and felt like a worsted weight one, which was actually perfect for the project. I decided to swatch out plain stockinette (for gauge mostly), a simple diagonal lace pattern, and a basic cable pattern. In the end, after washing, the cables really seemed to disappear into the halo. The client really liked the idea of the lace, so we decided to move along with that basic idea. As for pattern... I found a nice basic hat pattern (Noro spiral one-skein hat by Manuèle Ducret) and modified and worked from there to make a hat with the diagonal lace pattern all around. 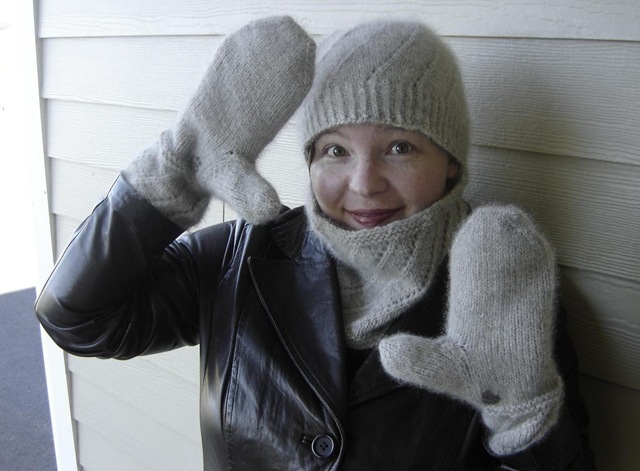 I used the same stitch pattern to make a "cowl" neckwarmer, and the gauntlets of the mittens. In the end, I ended up spinning quite a bit of yarn... I needed 50g for the hat, 110g for the mittens, and around 120g for the neckwarmer. 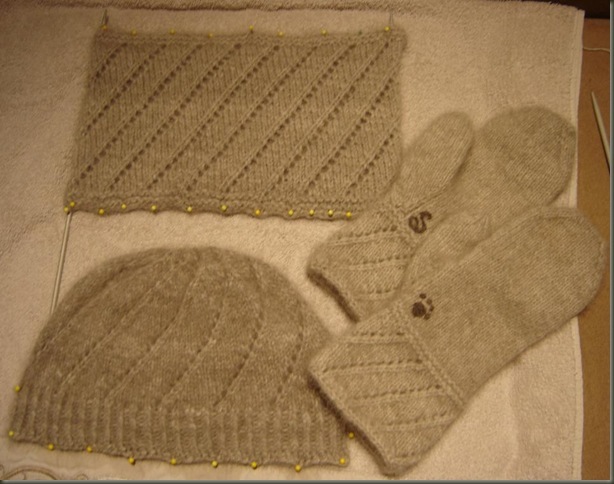 The process was enjoyable, though I was worried that I might not finish the set in time for cold weather. 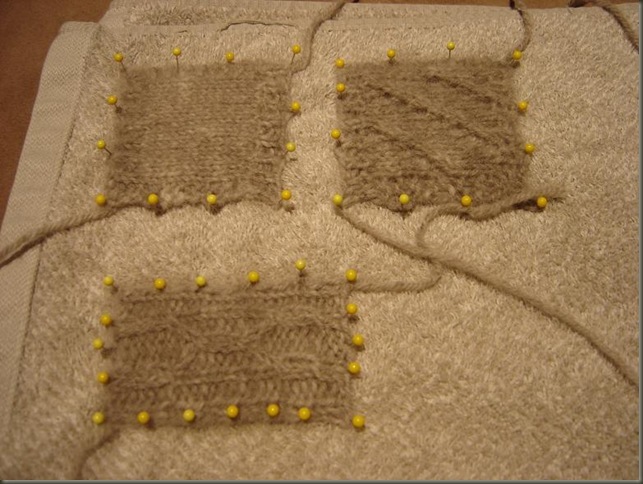 Custom knitting takes time, but sometimes I forget just how long that is. I was impatient and I had started knitting the garments before the entire quantity of yarn was complete... but next time I do something like this I think I will do all of the yarn first, so there will be less jumping around. In the end I was very pleased with the final results of the set. After the knitting and blocking process, the surface of the garments developed a nice gentle halo with a soft finish totally suitable for next to the skin wear. As you can see, the fur and the wool combined to make a warm oatmeal color, presumably which will match with just about any jacket. You'll notice that I monogrammed the mittens. The customer and I had discussed that it might be nice to have some sort of monogram or notation to indicate the fiber's source in the finished product. 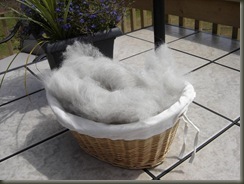 While spinning up the dog fur, I came across a couple of locks of darker fiber. 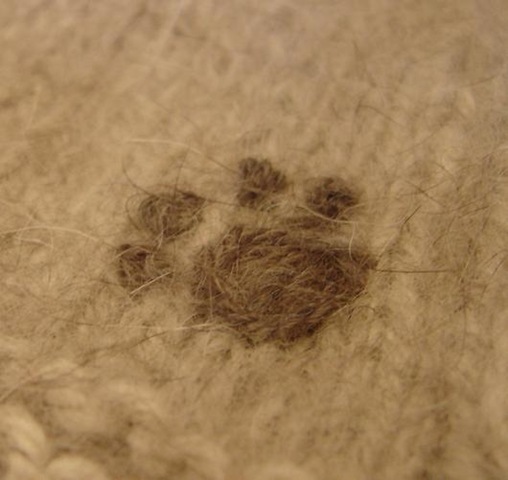 I picked out as many as I could and saved them, and then blended them with some natural brown wool, and used this darker yarn to add a little paw print, and an "S" for Samiya - the dog's name. <-- gratuitous embroidery shot! 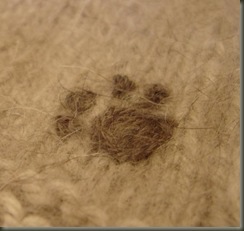 Puppy Prints! I finally brought the finished garments up to the owner last week... she seemed very pleased with the set, and excited to get to wear her new goodies! They also decided that her husband should have a pair of special mittens for himself... so after Christmas, I'll be working on some "work" mittens - basically a pair of men's hybrid mittens, with a separate pointer finger, and the rest of the fingers together a-la-mitten. My dad loves mittens like this, as they give better hand dexterity than mittens, but because more fingers are housed together, they are also warmer than gloves alone. Summer Knitting, and Bunny Antics! I have been working on a cowl (Alexstraza - by Robbyn Kenyon) and I just have to tie in the ends and manage some decent photographs! I enjoyed this simple project, and was more pleased with the results than I'd have imagined. 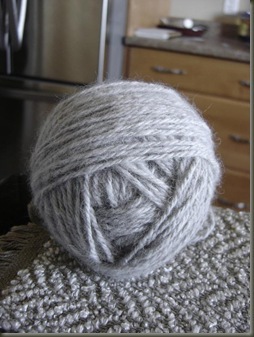 I only had a little bit of this yarn, which was my first real useable spindle spun yarn from several years ago. 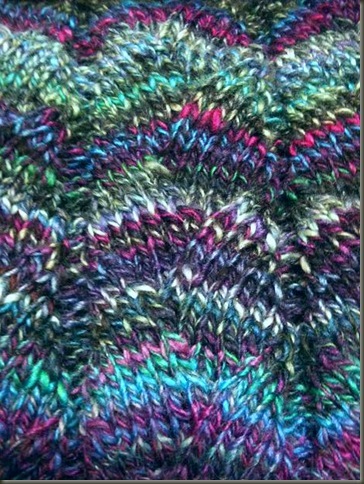 The fiber was a merino silk blend sliver from Fleece Artist that I chose from a bin simply on feel and color alone - I had no idea that silk was slippery and challenging! So I wanted to use the yarn for something practical, and since I didn't have enough for mittens or anything larger than a hat, a cowl seemed like a reasonable compromise. Robbyn's cowl was written as a flat-knit and then seamed at the end, but I decided to do the knitting in the round and forego the sewing part. There were no charts, only written out rows, but after a repeat or two I had no trouble following along. I was a little concerned in the beginning that my yarn would be too *busy* for the dragon-scale lace, but the pattern still shows up reasonably well and makes the stripes in the yarn look like ripples. Now I just need to do some blocking? the silk already feels nice around the neck, but I think a little soak and pinning will give this a more polished feel. Ruttiger is also enjoying the sunny summer weather. He finds things a little hot from time to time, so we try and cool him of by keeping some ceramic tiles and waterbottles in the freezer. He has been having fun nosing the frozen bottles around his cage, and welcomes a relaxing bunny-flop on a cool tile. 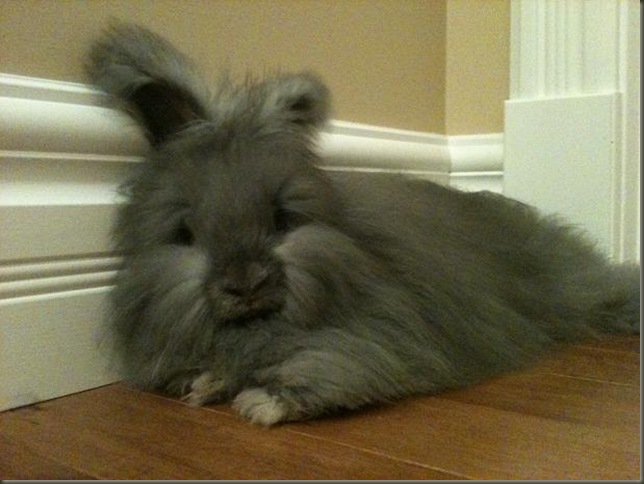 Here he is just Chillin' Out! He also loves fresh summer fruit? especially Pineapple!